Hi Everybody. Well, we finally got the new web site up and running – I love how easy it is to navigate compared to the old one. Hopefully you do as well. Charly Leetham did an amazing job – I have to admit that while I am a techo, there are things that I am simply not good at. Charly and her team have a natural flair for making amazing page layouts that are simple to use. The old web site used Microsoft Notepad as the web editor, which was ok to a point, but there was so much lacking. Now we have integrated shopping carts, so that the ordering process is simpler, galleries that are automatically updated when I add a new product, the ability to include heaps of images easily, so all I have to do now is get better at taking photos. In all, I am really pleased. But that’s not all we have to say….. no, not in a long shot…. Something AMAZING has happened – I can’t quite say what it is yet – but I will be able to soon – Just a couple of weeks. It is SO BIG and HUGE, that we have taken out some full page advertising in ‘Real Living’ here in Australia in anticipation (three months of it Again – Thank you so much Charly for helping design it for me) …… But, Nooooo…. I can’t say what it is. It may even be bigger than Adam from Myth Busters buying a clock… Possibly…. And I am soooooo bursting to. As we move rapidly towards the new financial year here in Australia I have had to review my pricing in light of material and insurance increases. Fortunately, because I am a hobby business my overheads are really small, so it is likely that the clocks will have to increase by about 10%. I will be applying the price change in the first week of July. Hi Everybody, We have just finished the prize draw for the free clock, and for the free kit. For the Kit – David from Western Australia has won his purchase price back. 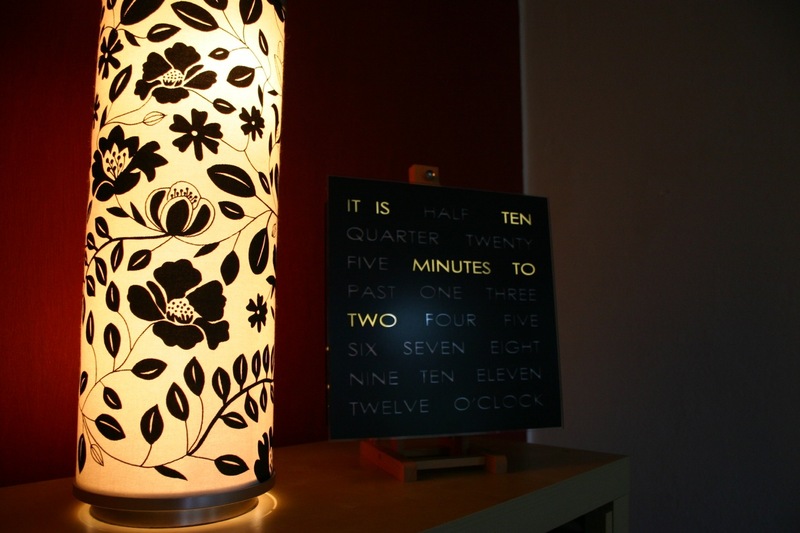 For the Completed clock – Melissa from Ohio has won her beautiful Black Space clock for free. Thanks to everybody who participated – It was a wonderful experience spending time with Charly from askcharlyleetham.com choosing the numbers for each prize draw, and then hitting the Paypal ‘refund’ button. Charly is redesigning my web site for me, making it so that it’s easier for people to find things, and so that there is a better shopping cart instead of the old fashioned Paypal buttons. I am really looking forward to the changes. 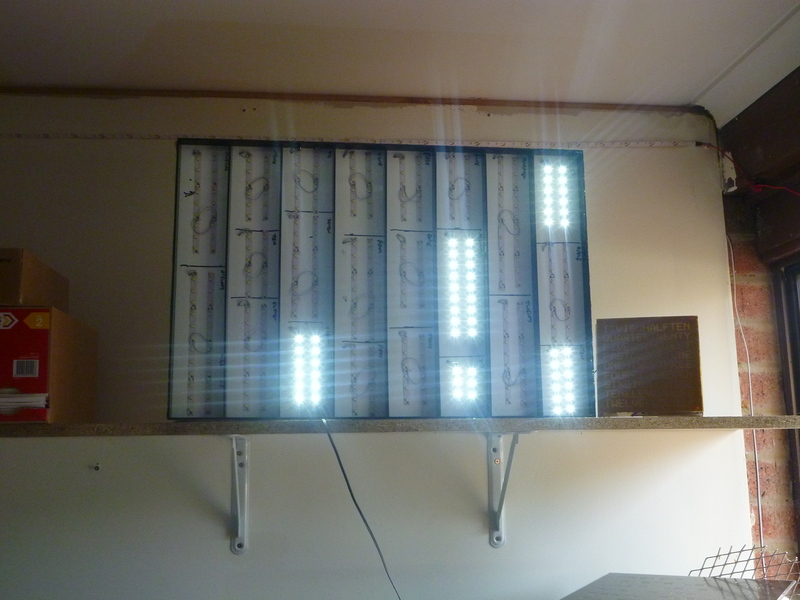 I have been commissioned to make a clock that is 70cm long by 50cm high – so here it is running the stress test for the LEDs on its side, as there isn’t enough space on my shelf to put it vertically – Next to do is the stencil. this clock is going to look stunning on the wall. 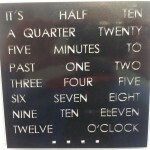 On the other end of the clock size scale is the new 150mm clock that I have been designing. 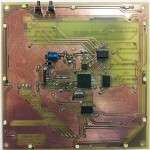 I have been looking at how best to design and make a smaller clock that can sit on a desk. A big driver has been how I could simplify the design to make it quick and easy to construct so that it can be much less expensive than my wall clock, while still being hand made here in Canberra. 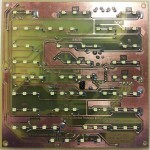 Unfortunately for my avid kit makers I can’t offer it as a full kit, as the soldering is really fine (0.5mm leads), requiring specialised techniques. 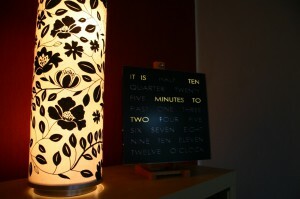 As you are probably aware, I don’t blog that much, but I do spend a lot of time working in my garage making clocks. Today I finished installing shelves and smoke alarms. The shelving is there to allow me to be better organised – it’s amazing the difference that makes. The smoke alarms are there to make sure that if anything bad happens in the garage we get warning. It is always better to be safe than sorry. If you are reading this, go now and check the battery in your smoke alarm. 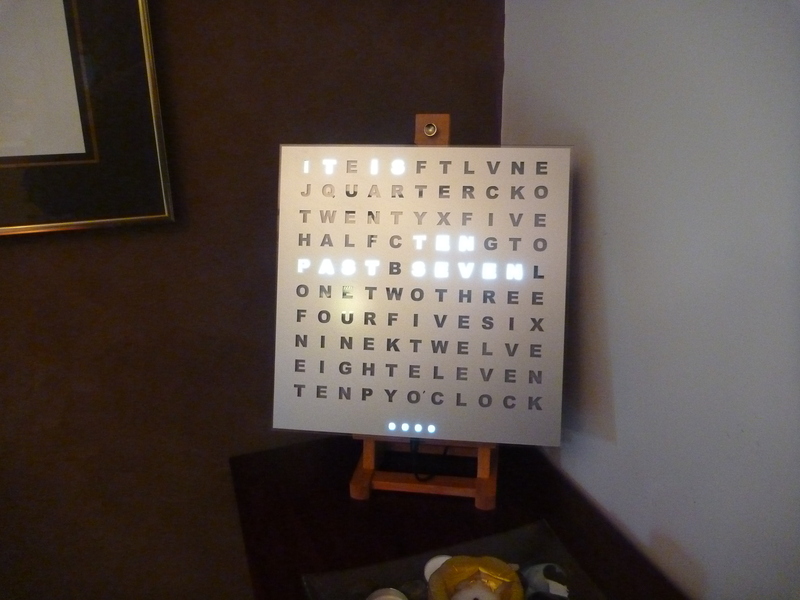 I have finished the 50cm clock – it looks prey cool – This one is silver, and it is beautifully bright. There is a presence when you walk into the room. Ok – I can finally talk about it. 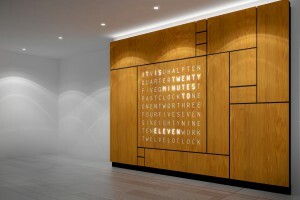 Last year, I was approached by an architectural firm in Brisbane to make a massive clock for them. They supplied an amazing concept drawing and asked me if it was possible. After a bit of a chat dividing the workload between us and figuring out how we can make it a reality, we decided that they would engage a signwriter to laser cut a sheet of wood for the stencil, and mount baffles behind it and do all of the mechanical work, and I would provide the electronics package to make it light up for them. It took a couple of months of designing, but I built a high current driver that can be used for making clocks that are up to 60 inches across, using double strips of illuminating LEDs across each word – nice and bright! Smiles a quite – happy – smile! 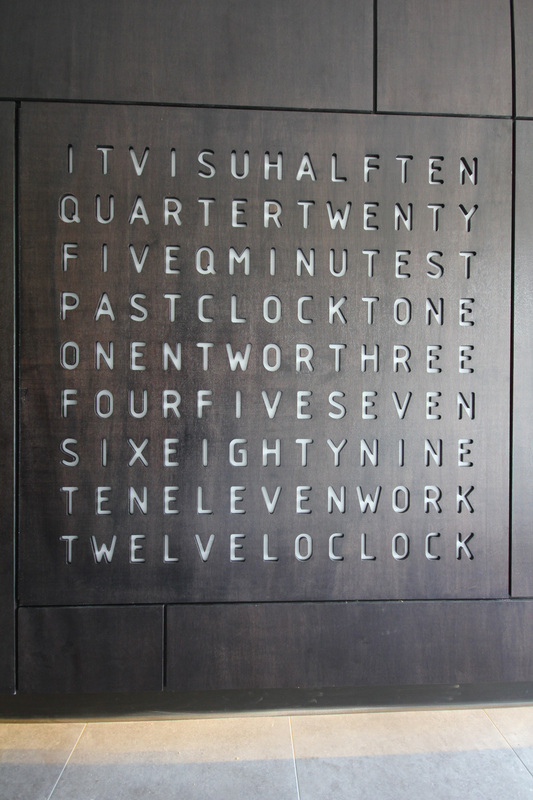 One of my clients sent me a beautiful photo of their clock in their room. They chose to sit it on a wooden canvas mount that they purchased from an art store. 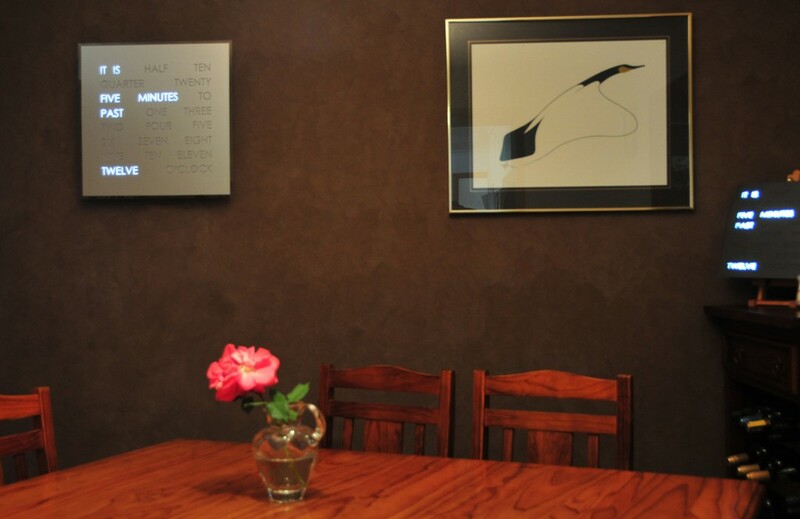 I loved that idea so much that I went to the art shop here in Braddon, and brought a mount for $30 – The clock fits it beautifully, and I don’t have to put it on a wall. Here is a silver random clock on a wooden frame – I am still not completely happy with the evenness of the illumination (especially down the left hand side), so it is not quite something that I am prepared to make available for sale yet. The last blog comment on this site was in November – It was a comment about how busy I was. Well – That is pretty typical of me. My basic nature is that I get focused, and loose track of the frilly bits (this blog being a frilly bit). My clock business is running well, orders have been caught up with, and I have made some beautiful custom clocks for people. The best bit of delivering a clock is the wonderful email that I get saying just how much the new owner loves it, or how “My husband couldn’t stop talking about it for 20 minutes, then we I argued about where it should live, but I let him win because it was Valentines day” – I love making beautiful things that make people smile.